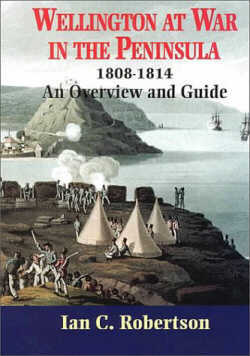 Wellington at War in the Peninsula, 1808-1814: An Overview and a Guide. Ian Robertson is an experienced travel writer with a long-standing interest in the Peninsular War. Wellington at War gives a lively and enjoyable introduction to Wellington's campaigns in the Peninsula (with a couple of chapters devoted to the Coru馻 campaign, but only passing mention of Barrosa, the East Coast and other subsidiary British operations). The writing is fluent and the tale moves briskly along, enlivened by a good sense of humour and a sharp eye for quotations that are both fresh and revealing. Robertson has read very widely in the memoirs and other primary sources of the period, and draws much of his material from works which have not been reprinted and which are unfamiliar even to specialists. There are no footnotes, but the quotations are well introduced and there is an excellent bibliography, so that one is seldom in any doubt as to the source of a story. As the title suggests, Wellington at War views the struggle in the Peninsula from a British perspective. Robertson is more inclined to pour scorn on the Spaniards for their undoubted failings, than to sympathize with the insurmountable problems they faced, or praise the persistence with which they continued the struggle. The French are regarded as worthy foes, although the looting and depredations that accompanied their armies are not passed over. But the emphasis of the book is on the operations of Wellington's army, its battles, its sieges and its campaigns. The set-piece descriptions of battles, etc. are well done, and the author's knowledge of the topography of the country is deployed to great effect, often quietly correcting errors in earlier accounts. But the most distinctive feature of Wellington at War is the wealth and quality of the illustrations that it contains. There are hundreds of photographs, portraits, prints and maps, all carefully chosen and placed in the text. On many occasions a contemporary print of a scene is set side-by-side with a modern photograph taken from the same position. There are excellent photographs of battlefields, for example that of Roli鏰 on p. 37 which does more than any thousand words to explain the action, or the aerial photograph of the country in northern Portugal through which Soult had to retreat after Oporto (p. 84). There are modern maps - many taken from the Michelin road atlas, which will help a visitor retrace the route of the armies - and old maps and plans of battles, from rare early sources such as Londonderry's Narrative or Eliot's Treatise on the Defence of Portugal. And there are the author's own useful sketch maps of the major battles, while the text contains some important comments on the maps available at the time and today. Unfortunately, the publishers have not made the most of this rich collection of visual evidence: many of the illustrations are rather pale, and the pages are too small for them to be displayed at their best. On the other hand, the book is small enough to slip easily into the bag, or even backpack, of a traveler intending to tour the battlefields, and it is ideal for that purpose. Several tours are outlined at the back of the book, and there are also some brief recommendations of where to stay. Such information risks becoming dated, but my own recent experience in Salamanca and Coimbra leads me to endorse it, and wish that rather more space was given to guiding the traveler. Nonetheless, this is a most welcome book, whether for the newcomer to the subject, or for the old hand seeking to tread familiar pathways, either on the spot, or in the comfort of their armchair.